On to Mandalay and a Bagan New Year! We had been told not to go to Mandalay; that it was dusty anddirty and nothing more than a big town! It was, however, the last royal capital of Burma, and I personally felt compelled to go there. We loved it! Yes, it was dusty and dirty, but if you took the time to explore it really did contain some veritable treasures. We spent a great few days there, exploring both on foot and on the back of a motorbike. We stayed at the Rich Queen Guest House! Nothing like a rich queen, hey! It was quiet and comfortable, yet right in the centre of Mandalay, near the central market. Smack bang in the centre of town, our guest house was virtually on top of the central market, which was abuzz with action from the early hours of the morning until dusk. We wandered around there several times in the course of our stay doing everything from eating, observing and buying. The natural focus of the city is an abrupt hill, rising above a vast moated and walled square. Once upon a time it contained a sprawling royal city but nowadays it is the reconstructed Mandalay Palace. Mostly an out-of-bounds area of military encampments, we certainly were not prepared to hand over some of our money to the Burmese government to see a smidgeon (of what they wanted us to see!) of the inside. We were quite happy to hire some bikes and go around the outside, observing daily life, the sunset and some other great temples surrounding it. Our Mandalay highlight, without a doubt, was the day that we both spent on the back of a motorbike taking in the many spectacular sights around the city. Myaung and Pho Se were just the best tour guides, not only taking us around but giving an amazing commentary everywhere we went. They both had a great sense of humour and had us laughing the whole way. We started at 8.00am and finished at 7.00pm. We came ‘home’ exhausted but satisfied! First off was the Mahamuni Pagoda, one of Myanmar’s most famous. Even in the early hours people were scuttling about, praying and observing. Alex had a chance to see the famous and highly venerated 13 foot high Buddha image, which many locals believe is 2000 years old. Over the years so much gold leaf has been applied by the (male only!) faithful that the figure is now entirely covered in a knobbly six inch layer of pure gold! Close by was the marble stone carving. It was amazing to watch so many people chip, blast and polish away in order to create Buddha images of all shapes and sizes, but I could not help but wonder what the fine dust was doing to their lungs! OH & S … what’s that! We then continued on to the bronze casting area, which was basically the bronze version of the marble version! All done by hand too. We then visited a couple of monasteries and even a nunnery. They were all very interesting and the number of rules they adhere to is quite impressive (if that’s the word). Not the life for me, I must say! But then I am not really one for rules, am I? Saigang as seen on the back of a motorbike. rise above the almost flat town centre of Mandalay behind. A steep walk up to the top of one of the pagodas (not for the faint or the weak hearted!) provided us with an amazing view over the sparkling pagodas, which apart from being an assault on the senses, looked like a highly polished 22 carat gold necklace. Sagaing is also known as the ‘Buddhist Land’ or ‘Religious City’ due to the many stupas in a relatively small area. Our guides also took us to a number of less-known attractions as we not only wanted to see the path less travelled, but we did not want to pay money to the government by going in to the main attractions. Often, we were the only ones there! We did, however, go to Amarapura, which is famous for U Bein Bridge, the world’s longest teak footbridge. It gently curves around the shallow Taungthaman Lake, creating one of Myanmar’s most photographed sites. It is said that the best time to visit is just after sunrise when hundreds of villagers and monks commute back and forth across it. We, however, went for the sunset. It was absolutely chockers and thronging with tourists. Our guides, however, took us underneath it, and showed us a different side … fishermen, people having wedding photos taken, kids swimming. They managed to make a touristy experience into a not so touristy one. They had certainly worked us out! Tourists aside, it was impressive indeed! Our Muslim roti hangout in Mandalay. And so our day on the back of a motorbike was coming to an end. As we made our way home, I contemplated life, with the wind blowing through my hair, or was that over my helmet and into my face! How lucky I am to be able to live the life I live! I felt at peace and I felt happy! We arrived back at the guest house exhausted, and thanked our guides profusely. I am not sure who was happier and more stoked … them or us! We were hungry so we went out to find a bite to eat. We had previously found a Muslim set-up on the road (quite literally!) that made cheap rotis and curries, and made our way over for a quick meal. Small tables and even smaller chairs by the side of the road, we shovelled the yummy food in. Our last day in Mandalay was spent seeing a few more of the local sights and meeting some new fun people, like Teresia and Fred from Swaustralia (is that what you call Swedes that have lived in Australia for ten years?) and their friend Jenni from Scotland. They would be going on to Bagan and so would we. Maybe we would see them there. Time was flying. Bagan would be our last stop and the place where we would spend our New Year. Horses, carts and temples of Bagan. I said a Bagan New Year not a bogan one! Whilst our bus ride from Hsipaw from Bagan was Winner Guest House. The owner is obviously very used to these ridiculous-o-clock arrivals, and so greeted us with a smile, a cup of tea and lit a fire by the roadside for us. Minties moment! Famous for both its sunrises and sunsets we decided to do both, not initially in one day, but that’s how it turned out! After a relaxing hour at Winner we decided to take a horse and cart and go and see the sunrise; so off we went in the early hours of the morning to Shwesandaw Pagoda. The tourists were arriving in throngs, with the same aim as us, to take some photos from a spot that is renowned for both its sunrises and sunsets. This pagoda not only offers mind-blowing views of the many temples that fill the surrounding valleys, but it’s also a spectacular spot to view the hot-air balloons that set off very close by. 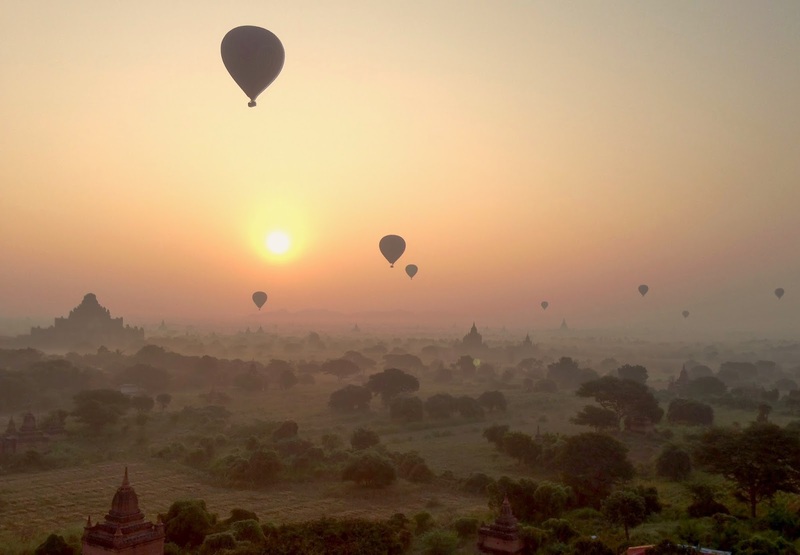 Balloons over Bagan is possibly one of the most exotic hot air balloon experiences in the world. If that’s your gig book well in advance and start saving your pennies! Alex and I were content with seeing them and not being in them … this time! Out and about in Bagan. We came back to Winner hungry but feeling exhilarated. After some brekkie and a shower, and feeling somewhat reinvigorated, we set off by bike to see what we’d come here for … temples, temples and more temples in a place that can only be described as a temple wonderland! Over the next few days we would see these countless temples on foot, bicycle and electric bike too. Beside highways and rickety train tracks amble ox carts through rice fields and rolling plains, all rimmed by the Shan Mountains to the east and the Ayeyarwady (Irrawaddy) River to the west, conjuring up scenes that hark back centuries. There were big temples, small temples, hidden temples, fancy temples, discreet temples, crumbling temples, all having something to offer. We often found that the hidden, more discreet ones were the most fascinating, as the local gatekeepers would come out, unlock them and tell us a story. On our first night we ended up back at the Shwensandaw Pagoda, along with throngs of tourists, viewing the sunset. Different, but equally as spectacular as the sunrise. Needless to say, that night we were buggered and slept like babies! Whilst in Bagan we also visited a couple of lacquerware factories and shops. The way in which they cut and weave the bamboo and then lacquer it is amazing. It’s quite an intricate process and to watch the several steps involved is very interesting. From tiny bowls to huge vases, we saw them ply away at their craft. Found a coffee-shop-stop at the Black Bamboo; great coffee but overpriced and overrated food. Of course, we didn’t eat the food, we just wanted a good coffee! With the Swaustralians and others on New Year’s. 10,9,8, 7,6,5,4,3,2,1 … Happy New Year!!!! And the fire crackers went off! Dangerous?! Not any more so than people dancing around (and not falling into) a fire!!! By 1.00am we were virtually being pushed out and told to leave! Keep in mind that the surrounding places had long closed and that the New Year is not particularly significant nor celebrate in Myanmar. The taxi drivers were asking for an obscene amount to drive the short distance to our guest house, so Alex and I decided to walk; coupled with the fact that we were totally sober and that Myanmar is generally safe at all hours, we felt comfortable doing so. Arrived safely and went straight to bed. The things you find in temples! Our last day in Bagan was perhaps a bit more cruisy than the others. We would be taking an overnight bus to Yangon, and our flight back to Bangkok would be leaving the next night. Our bus would leave at 4.00am and be getting into Yangon at ridiculous-o-clock (yet again). On the bus we bumped into our French friend Fabian; he’d been in Bagan too but we had not seen him. The bus ride was comfortable enough, and low and behold, there we were at the Yangon bus station just before 5.00am the next morning. Despite it being very early morning, the bus station was thronging with people. Fabien was going to Bangkok on the same flight as us, so we all negotiated a ride to the airport in a songthaew (passenger pick up). We decided that it simply would not have been worth going into the centre of Yangon, finding a place to store our bags and then coming back to the airport; the centre was an hour away from the bus station whilst the airport was reasonably close to the bus station. Eating up before we fly out of Yangon. OMG! I thought I was going to die! Seriously! Our driver was driving like a psycho! We all concurred that he was either drug or alcohol affected. We asked him to slow down but he seemed to laugh it off! I am the most easy going passenger but this time I wondered if we were going to make it to the airport alive! Every minute seemed like an hour and that ten minute ride had felt like the longest ten minutes of my life! We got off that passenger truck and I was shaking. We handed over our money, ‘thanked’ the driver and walked off. Big breath in, big breath out. I was standing and I was alive! That day at the airport was a very long and boring one. With only a couple of places to buy coffee and only one to buy food, we just sat down, relaxed, chatted and walked around the very small airport … several times. An exercise in how to occupy yourself indeed! Finally, it was time to fly. Bangkok here we come! Next: Last few days dining and shopping in Bangkok. View from the top of Saigang Hill. One of the lesser seen temples around Mandalay. Life beneath the U-Bein Bridge. Our tour guides, Myaung and Pho Se. Tranquility at a lesser viewed temple. Locals hanging around the temples. How some of the others live …children in Mandalay. Alex with the local kids, by the river in Mandalay. The many temples of Mandalay. Sunrise at the infamous Shwesandaw Pagoda. Back again … sunset at the Shwesandaw Pagoda. Inside one of the many temples of Bagan. Selfies with the locals of Bagan. Praying at the temple, Bagan. The many faces of Bagan. Partying with the lovely Fabienne from Switzerland! Hsipaw early morning fresh produce market. Seriously, what bus gets into … anywhere … at 3.30am! Talk about all dressed up and nowhere to go! The bus dumped the three of us (we were travelling with our French friend Fabien) somewhere on the side of the road in the little hamlet of Hsipaw. We had a map and so the three of us navigated our way to Mr Charles Guest House. It didn’t take us long to get there, but everything was still very quiet and the gates to the hotel closed. We tried to quietly get someone’s attention, and after ten minutes or so, someone finally let us in. What to do? We relaxed for an hour or so, and then walked over to Hsipaw’s fresh produce market, which starts at 4.30am. We were not going to be able to check in until much later, so we figured we may as well use our time wisely. Whilst I do love markets, getting up at the crack of dawn is not generally something that excites me. But here we were … the market was lit up by low-level lighting, and people were selling all types of fresh produce from veggies and hers to chicken and meat. It was great to walk along, observe and get caught up in the market atmosphere. What does infuriate me, however, are the tourists that treat such a magic moment as a ‘freak show photo opportunity’! I wanted to say, “Dudes, get that camera out of their faces!” We are always mindful of this, even if it means getting blurry or distant shots. Show a bit of respect! Once back at the guest house and checked in, we had some brekkie and then went for a walk around town and then on to a beautiful walk through rice fields, general country living and the gorgeous Namtok Waterfall. This was a world away from the world as we know it … country people happily doing their country thing with smiles on their faces and a hearty ‘mingalaba’ (hello) … where did we get it wrong! I felt happy, inspired, rejuvenated, at peace … it can only be described as that magical ‘traveller’s minties moment’ that travellers know so well! That evening we also visited the Shan Palace, which was where the last Shan Prince lived before he was abducted by the military. It is now lived in by his nephew and family. A family member, Fern, was most keen to chat to us, show us pictures and tell us what had happened. Even only a year ago this would not have been possible and the nephew was actually jailed for speaking to foreigners. Indeed Myanmar is changing at lightning speed! Hill tribe kids around Hsipaw. northern thailand 20 years ago! I remember doing that trek in Thailand 20 years ago and loving it, then going back ten years later to see how much had changed (not for the better – welcome to the freak show!). Would a trek here capture the magic that I remembered from 20 years ago? Along with Fabien we organised an overnight trek from the guest house. Leaving the next morning, it would be just the three of us and our guide Kyaw-Kyaw (pronounced Jo-Jo). We left on the 24 December and came back on Christmas day. What an amazing two days! Our knowledgeable guide took us through valleys, fields and villages which offered simple people and spectacular views. This is what it feels like to be truly alive! I felt so incredibly lucky. Coffee stops (not so nice and in wooden huts), playing with the kids and observing the general living of the various tribes were the highlights. The main villages we passed through were either Shan or Palau. I must say that whilst the Burmese food did not blow me away (too oily and too many fried things), the fresh veggies were amazing, and the way in which the villagers cooked them was amazing. On both days, our lunch was amazing. Indeed, my favourite food in Myanmar was on this trek. Christmas Eve (keeping in mind that it’s not celebrated in this Buddhist country) was spent in a basic, sparse wooden hut, with a Palau villager cooking us dinner and her young son who said nothing as part of his training as was robed in monk’s attire. This child, however, had the most amazing energy! We all sat around the open fireplace drinking tea as the mother cooked and the child watched. Priceless! This family was totally unaware of the commercial fracas that would be occurring in our own countries at this very time. I felt totally at peace! These people seemed to have so little and yet they had so much. We, on the other hand, have so much, but in many other ways so little! When the lady finished cooking she retreated into a corner and started chanting … in the same room as we were in; it was the only space she had! These are the moments that have shaped the way I think about the world in which I live. I had the most peaceful night’s sleep, and woke up to the rays of the sun streaming through our window. Again, we were cooked a hearty and healthy breakfast, of mainly vegetables. I observed the red dusty floor outside (no roads!) and the way in which the villagers had to walk to the well to get the water. The amenities were basic, electricity virtually nonexistent and yet the people always offered a smile! This was a world away from my own! We said our goodbyes and I thanked our host profusely. “Please come back again. You are welcome here anytime”, she told us through our guide. Perhaps, I thought, but there are so many other places I need to see in this lifetime! And so, on Christmas Day, we made our way back to Hsipaw … it was like any other day to the villagers we met and waved to along the way. We stopped at a school in one of the villages, and I could not help but notice how bare their classroom was in comparison to ours. In fact the school was only one classroom! I thought about the kids over here whinging, whining and complaining about not wanting to go to school … they needed to be looking at this! A happy little bunch they were, but how many of them would progress and get the education they deserve? An issue close to my heart; education (along with health) is the only true way forward. Just after midday we were met by a pick up which took us to some ‘natural hot springs’. OMG (I am going to sound like a ‘precious tourist’ now!) … the ‘hot springs’ were two concrete boxes (one for the men and another for the women) filled with people scrubbing every single bit of their bodies (in the water!!!) as well as other bits that I did not know existed! This was surrounded by food stands and lots and lots of rubbish! Did we want to go in? Fat chance!! Was I sure? Absolutely! I could well and truly wait for a shower when we got back to the guest house! Back by 5pm, we thanked Kyo-Kyo profusely, for our amazing experience. The evening was spent relaxing. Tomorrow we would take it easy and catch the overnight bus to Bagan, which of course would be arriving at ridiculous-o-clock once again! here for some 15 years. We had heard about this place on the grapevine, and I must say the coffee was excellent. Whilst culture immersion is important to me, my weakness is good (actually excellent) coffee! Alex and Fabien in the fields around Hsipaw. The only mosque in Hsipaw. With Fern at the Shan Palace, Hsipaw. Our guide, Kyo-Kyo and a hill tribe toddler. Alex hangin’ out with the village kids. Fabien shows a little kid a picture of herself. This is the way we build a house! Hill tribe kid teaching Alex about ‘how to entertain oneself’! Life in a Palau Village. Great shakes at Mr Shake’s, Hsipaw. Back from our trek; exhausted but happy. Flying over central Australia en route to Bangkok, via KL. With only a couple of months behind me since I’d been to Thailand, oops, I was doing it again! Well, actually, Alex and I would do a few days in Bangkok, followed by a little over two weeks Myanmar (Burma) followed by a final last few days in Bangkok (read … I really wanted to make sure I got to the infamous Chatachuk market). Myanmar or Burma? That would require a post (or two) unto itself! Ombi, Thai coffee and Nu Deang. Having just secured a new job, and with both Alex and I having a couple of weeks off over Christmas, we decided to get away. What better way to spend our ‘free time’ than travelling? Around the festive season there is no such thing as a cheap ticket, so we did our best by buying a Melbourne-Bangkok return and a Bangkok-Yangon (capital of Myanmar) return with Air Asia. To be frank (would you expect anything less from me? ); I love bypassing the festive debacle. As much as I love my family, I love ‘missing out on’ the presents, the hype, the commercialism, and a tradition I find overwhelmingly outdated. I secretly, well perhaps not so secretly, wish that we could make a bigger effort with people between New Year and Christmas and not just the few days between Christmas and the New Year! Slap! That was me slapping me off my bandwagon! Oh yes, back to the trip! Loaded with two weeks worth of a brilliant handover notes at my new job, I jumped onto the plane exhausted. I had spent most of the last week trying to get ready inbetween trying to take in lots of new information. Does it come as any surprise that I fell asleep before take-off? With Link’s family and baby Sean. Thailand is easy for both Alex and I; we have done it so many times that it really has become second nature. We would both be going to Pong and Link’s house together, for a couple of days. These are the gorgeous friends I stayed with when I was here on my last trip. Land, pick up bags, go through passport control, grab a taxi, go to Pong and Link’s. The roads have improved considerably in the last couple of decades, and especially when it’s not peak hour, getting around Bangkok is a breeze. We were there in no time at all, with Pong, Link and Nu Deang there to greet us with open arms. Nu Deang came out and gave me a big hug; she remembered me as I had been there only recently. She recognised Alex too as we had spoken to him several times on skype. Nu Deang took me to see her baby brother Sean; he had most certainly grown in only a couple of months. What a cutie! The next couple of days really were lots of fun! Good times and good food with Pong, Link and both of their families. Alex and I would not make it to Kanchanaburi to visit Pong’s parents this time, but they came to us. I also managed to fit in a haircut with the lady that I had it cut by last time I was here. Ten minutes and done! I love it! I am one of those ‘cut my hair and let me get out’ kinda gals! Don’t want to hear your problems, or your whingeing, just cut my hair and let me leave! December is a lovely time to be in Bangkok as the humidity is low and the temperature pleasant. Pity I did not do my homework on Myanmar though … more on that later! Loaded with tummies full of great food, and hearts and minds full of good times, we were off to Myanmar. After hugs all around we jumped into a taxi and were on our way to the airport. A new adventure awaited us! Myanmar here we come! On the way from the Yangon Airport to Downtown. As I mentioned, we had barely done any research, with only a Myanmar Lonely Planet in tow. All I knew was that tourism was booming and that the accommodation, and many other prices, were also outdated. Oh well, I had the right clothes (!!) with me and we were used to wingin’ it. So, here goes. The flight to Yangon was short and painless and after a little over an hour we found ourselves in Yangon. Let the journey begin! In practice this was my second trip to Myanmar, in theory my first. In the mid 90s I remember doing a ‘half day tour’ from somewhere in the south of Thailand, because … well, it was not really the done thing then, and well, I could! All I remember was that it rained and rained, the temples looked different and that the people seemed very poor! Having said that Thailand too was very different back then. With some fleeting memories, I wondered how Myanmar would stack up in 2013! Burmese vendor with the infamous Thanaka on her face. We had at least booked our first few nights in Yangon and would be staying at the Hninn Si Budget Inn. We had organised this from Australia, including a free pick up from the airport. Samsun, our driver, was there to meet us, and in the 30 minutes or so it took to drive us in, we learnt some basic Burmese. Mingalaba (hello) and Gesu ve (thank you) would be used many, many times over on this trip. This was exciting! I felt like a little kid, as I stared at the surroundings as Samsun taught us Burmese and explained what we were looking at. Very different to Thailand. Most definitely poorer. My appreciation of Myanmar after our two week stay would be ‘it’s what Thailand was like 20 years ago’. We arrived at the hotel, and settled in; very basic, but very clean. The number of visitors to Myanmar is comparatively small compared to her neighbours, which is primarily due to its current political situation. After the military junta transferred power to a civilian government in 2011, the tourism sector saw a massive increase and in 2012, for the first time in the history of the nation, tourists numbered more than a million. It is believed that this more than doubled in 2013. So, we were living the change. One side effect of this lightning speed growth and change is that prices for things such as accommodation, transport and tour services have more than doubled in a period one to two years. We had also read that ATMs were virtually non-existent and that only crisp, off-the-press US dollar notes would be accepted. Not that we felt overly comfortable carrying a wad of US dollars, but it did not seem like we had much choice. Once there, we found that although not common, it was not impossible to find the odd ATM. As I mentioned, we were living the change that is occurring in Myanmar right now! Holding up the Sule Pagoda. We spent a couple of days in Yangon, taking in some amazing sights, such as the Sule and Shwedagon pagodas. The former is a spectacular temple which was within walking distance of our accommodation. Surrounded by government buildings and commercial shops, it’s not every city whose primary traffic circle is occupied by a 2000-year-old golden temple. It is particularly beautiful at dusk and indeed very atmospheric. We did not actually go inside as we had to pay … and considering the way in which the country spends its money, Alex and I were very cautious about paying out! Whilst Myanmar is a geographically beautiful country, populated by gentle people, it is also notorious for its human rights abuses, so we wanted to ensure that as little of our money as possible was going to the government, via things such as entry fees to temples! I almost lost my marbles when we were told that we had to pay USD $8.00 to get into the Shwedagon Pagoda. Whilst it is the ‘Burmese Mecca’ and arguably the most famous and impressive religious structure in the entire country, I was incensed at the thought of where my money would possibly go. In a country where wages are around USD $40-$50 per month, I found the $8.00 entry fee ludicrous! Come in ‘toursist’ spinner! Breathe in, breathe out … after a little tiff with Alex, in we went … it was swarming with tourists and I was trying not to do a head count and tally the government’s profits! I just have to let some things go! I should explain that whilst Myanmar’s currency is the kyat (pronounced chat), that the country also uses the American dollar … nice clean and crisp notes thank you very much! The exchange rate is approximately just under 1000 kyats to the US dollar. I must say despite my little hissy fit, I did enjoy the Shwedagon Pagoda; it is indeed a spectacular sight. We went there in the later part of the afternoon as it morphed from a glittering bright gold to a crimson gold and orange as the sun casts its last rays. Despite the number of people and my initial trauma, I was still bedazzled with the visual intoxication it provided me with. As the masses poised their cameras to take the usual touristy shots, I walked around and tried to take in the peace and tranquility of the beautiful temple away from the maddening crowds. I had found my peace! The many faces of Myanmar, Yangon. Over the next couple of days we casually walked around taking in everything from ports to Musmeah Yeshua, Yangon’s only Jewish synagogue; people watching, of course, was the compulsory activity. The sprawling mess of the Bogyoke Aung San Market was in the mix … markets always are! Myanmar, despite its recent surge of tourism is still very much a third world country. The roads desperately need repairing, the footpaths are often pot-holed viewing platforms for the sewerage and mosquitos that live below and most cars would not … have passed a basic inspection … 20 years ago. But it’s the people that really captured our hearts! Always a smile which became even broader when we would say hello in Burmese! I could not help but wonder if this would all change when the country would be ‘permanently damaged’ by tourism. By the end of our time in this country, we would note that it was like Thailand 20 years ago. With change always comes the good, the bad and the ugly! Myanmar … watch this space! Alex’s doppelganger, on the stop over to Inle Lake. Our next stop would be the placid Inle Lake, in Shan State, an overnight bus ride from Yangon. I must mention that whilst relatively comfortable, the overnight buses in Myanmar would rock up at their destinations at really odd hours, like 3 or 4am in the morning. What does one do at this hour? And speaking of buses and the likes … we took a taxi to the Yangon bus terminal, which was some 45 minutes away from the centre, to encounter a bus city! Seriously, this place was an entity unto itself! I had never seen anything like it … buses, people, cars and food stands everywhere! It was indeed a small city. We ended up on a VIP bus to Nyaungshwe near the edge of the lake, which was three seats, rather than the usual four, across. Very comfortable, but freezing! Hello Kitty had never looked so good; the blankets provided were thick, warm and well, very Hello Kitty! We met Fabienne and Jochen, a fun Swiss/ German couple who we chatted, laughed and had a middle-of-the-night food break with. Crazy young travellers like us, note the young! Check out their blog. We tried to sleep through the cold, but I struggled as I found it uncomfortably cold. When we arrived at Nyaungshwe in the early hours of the morning, I understood why … not only had the bus been cold, but it was very chilly outside … as in mist chilly! When I had looked at temperatures across Myanmar, I had looked at the top temperatures, but not the bottom ones. We were going to have some cold mornings and nights in this place! We had booked Remember Inn Hotel from Yangon the night before, and once off the bus we made our way there. A thin veil of mist covered the town (and us!) as we walked the short distance to our destination. Sure it was peak tourist season but in Myanmar we never really felt bombarded by by people and tourists. We had not made any advance bookings as we did not really have an itinerary; the plan of action was to book only a night or two in advance, once we had worked out where our next stop would actually be. Sometimes we got a place first pop, and other times it would take a few goes. Luckily, all the places we chose (again, what would we do without mobile technology and the capacity to review potential places!?) were comfortable and clean. Over our two weeks we would pay between USD$20.00 and $40.00 per night with $25-30 being an average (double bed and private bathroom). This has apparently more than doubled in the last couple of years. This is what we call progress! Our boat on Lake Inle. Nyaungshwe has grown into a bustling traveller centre, and this place is probably as close as Myanmar gets to having a backpacker scene. And with a backpacker scene comes good coffee … of course I found some! We even found a restaurant that made great soup and veggie dishes; Wa Toat became our local! On paper, Inle Lake is about 22 kilometres long and 11 kilometres wide, but it really is hard to tell where the lake finishes and the marshes start. In any case, it is obligatory, almost a rite of passage, to do the Inle Lake longboat trip. The drivers of the boats will almost certainly find you, before you find them. Indeed we were approached by many, and in the end we went with an affable guy called Kyo-Kyo (pronounced Jo-Jo). So, we spent a day on the lake, looking and stopping at everything from stilt-house villages and floating gardens to lotus weaving and cheroot (a type of cigar) making. And then there were monasteries (including the famous jumping cat one, but there didn’t appear to be any cats, let alone jumping ones! ), temples and pagodas. There are a number of tribes and groups in the country, and the Lake is renowned for the Intha technique of leg rowing, where one leg is wrapped around the paddle to drive the blade through the water. The balancing act is amazing to watch! We also happened to be in Nyaungshwe on its big market day, where hill tribe people come from around the surrounding areas to sell their wares and food. I had a mission … to buy another jumper! My legs were OK in the only pants I had, Thai Fisherman’s pants, but I just needed that extra layer up top for boat trips, early mornings, late nights and bus trips. I picked myself up a lovely little grey number. In fact, so lovely that I only ever wore it inside out! The style was acceptable, the print on it was not! Well, it’s certainly better than being cold! We were going to visit Mandalay next, but we’d heard of a little place called Hsipaw up north, that was supposed to not be very touristy as well as being a great place to do some hill-tribe trekking … the kind of trekking that was available in northern Thailand years ago before the masses descended. With a flexible itinerary and no firm plans, we decided that that would be our next stop. So, we booked our ticket and were off without further ado. The infamous fishermen of Inle Lake. As usual, the bus would arrive at its final destination at a really odd time … 3am! We tried to choose the bus that left latest but that made little, if any, difference. We met a great French guy, Fabien, at the bus station as we were leaving Nyangshwe. We would end up at the same guest house in Hsipaw and in fact on the same hill tribe trek. We actually met some lovely travellers not only around the Inle Lake area but around Myanmar in general. We noticed that it was a bit more of a mature travellers set and that there were very few young, say under 25s, around. I feel Myanmar just takes that little bit more to navigate and it most certainly isn’t party central. If it’s a party you want you are certainly ‘barking up the wrong country’! Next: An ‘uncommercial’ Christmas in Hsipaw, Mandalay and New Year in Bagan. This is how we wire our house,! Yangon. Alex enjoying Shan soup in Yangon. OH&S eat your heart out, Yangon. Local Thai coffee at Pong and Link’s local market. Leaving Melbourne Airport, with the obligatory coffee. Nu Deang with Pong’s parents. Free wireless at the temple; how times have changed! No money to pay your USD $8.00 entry fee? Do not fear! One of the many mosques in Yangon. Downtown Yangon with sule Pagoda in background. Reading the morning paper, Yangon. Nyaungshwe morning market, Inle Lake. Chicken anyone? Morning market, Inle. The wheels on the bus go ’round and ’round. This trip was proving to be lots of fun and I had , as usual, been able to pack in a fair bit. Pong and Link had asked me to come back and stay with them for my last few days, but I had some serious ‘Bangkok cramming’ to do and I needed to be in the middle of the action to do it. I had already booked my hotel, Siam 2 in Banglamphu. We had stayed there there on our last trip so I knew exactly what to expect and how to get there. It was comfy, clean and close enough to the action without actually being in it. The minibus from Kanchanaburi stopped very close by and I swaggered to my accommodation like a local … although I am sure that with my backpack, I hardly looked like one! This part of Bangkok always feels like home to me! I was on a mission … as Alex tells me, I usually am! I immediately went to my ‘local’ dentist and made an appointment to have my teeth cleaned and checked. I only ever use dentists in Australia if I have to as they are exorbitant compared to other countries. Appointment next morning! I met some lovely people at Siam 2, including Aussie sisters Diane and Deb and Argentine-Brazilian couple Gabriele and Cybele. It’s always lovely to meet people who you click with. Siam has a pool so a few nighttime sessions reminiscing about both Brazil and Argentina were had. Cybele and Gabriele, don’t be surprised if I do knock on your door in Buenos Aires and say hello! My next days were spent walking around various parts of Bangkok, eating (bring Thai Street food on! ), having massages (stick those elbows in, none of that ‘soft’ stuff for me! ), people-watching, shopping, jumping on and off buses, which of course included meeting and chatting to people, and … I was even able to fit in some sightseeing of the cultural sort. I must say, I was a bit disappointed with Mahboonkrong (better known as MBK) Centre. At eight stories high and with some 2000 shops, it’s a shopper’s mecca. I must say, I think it has gone rapidly down hill in the last few years, and the shopping just ain’t what it used to be. It seems to be more expensive and more commercial. Oh well, I still had Chatachuk to go. This is the mother of all markets, and seriously, if you can’t find it here (15 000 plus booths!) you won’t find it anywhere! For someone who hates shopping, I love this place! I love the vibe, the frenetic energy, the mix of people, and the many, many different things on offer. As usual, I put in some serious hours, but my diligence paid off and I found and bought what I was looking for. On my way back from the market, I visited Jim Thompson’s House (the cultural, sightseeing bit), very close to Siam Square. I have been meaning to do this for years but somehow have never gotten around to it. Jim Thompson was an American who moved to Thailand in the 1940’s and in 1959 pretty much single- handedly turned the Thai silk industry into a hugely successful export business. What’s remarkable about ‘this house’ is that it’s actually a collection of six traditional Thai wooden homes which he then reconstructed in a jungle like garden. Thompson was also an avid collector of both Thai and oriental art. The guided tour was well and truly worth it. Sunday night had arrived and I had fitted in everything I needed and wanted to do. Always room for more though! There’s always next time, and of course there will be a next time! I would be flying back home the next day, on my birthday 14 October, but with the stopover in Brunei, would not get home until the 15th. Another trip down, and many, many more to go! Next: Christmas and New Year in Myanmar (Burma) … with stopovers in Bangkok … of course! Ah Ronald … you can run but you cannot hide! Pretty clothes for the bigger woman? Miss Tim in Ko Samet, why not Madame Joe in Bangkok? Packed and ready to go, the next part of my adventure was about to begin. Pong’s parents, Chai and Ta, have a holiday house in Kanchanaburi province, but since Chai retired a few years back they go there much more frequently. Pong made me out a handwritten map, with excellent directions in Thai. I had to first catch a bus to Kanchanaburi, and then an ongoing bus to Thong Pha Phum, from where her parents would pick me up. Their house is then some 10 kilometres away. Pong’s map was a bonus! As a backpacker, I am accustomed to playing it by ear and winging it. Having said that, mobile technology has most certainly changed the way we do things. With all of us liaising on our mobiles, pinpointing my pickup was easy. Many would argue that this takes some of the fun and excitement out of travelling. Hmm, another discussion for another day. Meanwhile, I was picked up at the tiny bus station in Thong Pha Phum by Pong’s parents. I must say, I got a great vibe from this tiny town wedged between shaggy karst mountains. No tourists, and very traditional. I knew I was going to love it! As is often the case, the bus station was right next to a market, and you all know how much I love markets. Chai and Ta arrived soon after me and there were hugs all around. I had met them both at Link and Pong’s wedding in 2007, but very briefly. Ta bought a few more bits and pieces in the market and I followed her around. The word had gotten out … Ta is a fantastic cook! We drove the short distance to their house which was made of wood and was surrounded by lots of trees and foliage. As soon as we walked through the front door, I immediately fell in love with it as the dining area was out in the open and the house backed right onto a stream. My ‘room’ would be downstairs; a tent set up in another open area with the sound of running water as my backdrop. You can’t imagine how soundly I slept that night! Ta and her many dishes! Ta weaved her magic and made a number of amazing dishes that night. Names not known, tastes to die for! The pictures tell a thousand words. I just loved Chai and Ta! Chai’s English was really good, whilst Ta and I communicated using lots of sign language, which seemed to work no problem. I am a firm believer that if you want to be understood you will be. When I went to bed that night I just felt pure bliss. The next day was lots of fun. After a lovely breakfast, we went to Hin Dat Hot Springs. The naturally hot spring water is between 45 and 55 degrees celsius. Must say, after an hour there I felt like I had been hit with a shovel! Chai took us to a great place overlooking the jungle for lunch and then it was time to go home and chill … to be later followed by another round of Ta’s amazing food. Over a couple of days that I was there, I also met a number of Chai and Ta’s friends who had also retired and come out to live in the countryside. Some came over and others we went to visit; all within walking distance. The next day was a busy one and we visited a number of places. There are some spectacular national parks with some phenomenal views. Khao Laem Dam, officially known as Vachiralongkorn Dam, is only six kilometres from Thom Pha Phum. At just over a kilometre long and 92 metres high and with spectacular scenery around it, it’s quite breathtaking. There were lots of monkeys around and there are signs everywhere telling you not to provoke them. I got a bit too close to taking a photo of one and he was not a happy camper. I had to scuttle back, as he inched towards me with a don’t mess with me look. Was not quite expecting that! We also visited the famous Three Pagoda Pass near Sangkhlaburi, where Thailand borders with Myanmar (Burma). The three pagodas for which the pass is named are quite small, but it’s the history and fact that it’s a border crossing (sometimes!) that makes it interesting. I had been here many years ago as a backpacker; yeh, still a backpacker and still young! It’s where you come if you want to see Myanmar without really seeing Myanmar, you know, like Clayton’s drink. I will have to dig up my old photos; the place has most certainly changed in some 20 years or so since I first visited, as all places do really. Sangkhlaburi is a very interesting place too. It’s a brilliant example of a border town’s ethnic spectrum, with a mix of Burmese, Karen, Mon and Lao as well as Thais. The mix is evident as you look around. Even if you can speak Thai, it may not necessarily be all that helpful here as so many other languages are spoken. Ta and I made our way across the famous yet somewhat unfortunately named Wangka (thankfully also known as Monside!) Bridge. Its claim to fame is that it is a picturesque rickety wooden bridge, but perhaps it being rickety was also its downfall … quite literally! Very recently a flood or storm had swept half of it away! So, the picturesque bridge quite literally stops halfway, and drops into, well, the river below! We also visited some lovely temples in the area, including Wat Wang Wiwekaram. It’s always lovely to walk around temples and observe the beautiful architecture. What I liked about the ones that we saw around Sangkhlaburi was that I was the only tourist and so I was able to observe the locals in their own habitat. What a day! We had seen and done so much, yet once again Ta weaved her culinary magic and I was treated to yet another spectacular Thai meal. I was most certainly going to miss Ta’s food. I asked her if she was interested in coming to Australia and being my personal chef! The couple of days had gone far too quickly, but I had seen, done and eaten so much. It was easy to understand how Pong had turned out to be such a wonderful person; she has two wonderful parents, who I was most certainly going to miss. The morning that I was to make my way back to Bangkok, we went to visit some of Chai’s friends as well as a Burmese family, who all lived within walking distance. Being so close to the border, there are a number of Burmese refugees in the area. The war between Myanmar’s (Burma) army and the jungle-dwelling Karen ethnic group has been running for 63 years and is ongoing. The civil war is often labelled the world’s longest. Needless to say, the Burmese are desperate to get out and will try anything in their power to do so. Tragic! With hugs all around, I was back on the minibus to Kanchanaburi, where I would have to change once again for Bangkok. I promised them both that I would be back with Alex. I waved to Chai and Ta until they were out of sight … and then I cried. It’s the part of travel that I least like … saying goodbye. Bangkok awaited me. My last few days would be spent shopping and just hangin’ out in one of my favourite cities. Bangkok, you never, ever disappoint me! Dedication: Chai and Ta, I would like to thank you for your amazing hospitality over the couple of days that I spent with you. You showed me your kindness and warmth in everything you did. It made my heart sing to see the smiles on both of your faces. You now have a place in my most special place, a place I only reserve for special people, in my heart. I look forward to seeing you both again very soon. At the Dam … this could be used for people too! Red hot (and green!) chilli peppers! Sticky rice and banana … yuuuuuum! Yes, ir really is ALL about food! When the going gets tough … travel! Off to Thailand … yay! One door shuts and another door opens! Oh, how I love the travelling door! She is always kind to me; never creaks, never hard to open and always opens with the first push. So, in between jobs, I decided to sneak away to Thailand for a couple of weeks … as you do! Organising the gig? Yeh, that would be five days prior, and booking the cheapest flight I could, which ended up being on Royal Brunei. October’s not a bad month to travel through Thailand. OK so it’s the monsoon season, but seriously, worse things could happen in life! I thus spent the nights of my last working week getting myself organised for Thailand. Yep, finished work on the Friday, and was flying to Thailand on the Saturday. Whoo, hoo! I had a vague idea of what I wanted to do and where I wanted to go and I had just over two weeks to do it. Alex and Dad took me to the airport, and before I knew it I was off. In usual Ombi style, I introduced myself to the guy sitting next to me, and Daryl and I had ourselves some pretty decent conversations over the course of the flight. A brief stopover in Brunei and we were in Bangkok by 8pm. I would be spending my first couple of nights with my dear friends Link and Pong and their family. I met Pong in the early noughties when she was studying in Australia, and Alex and I attended her wedding to Link in 2007. They have since had two children, Grace (Nu Deang) who we met when we were in Thailand in early 2012 and Sean (Singh) who was only a couple of months old, and whom I would be meeting for the first time. Luckily it did not take me long to get through passport control and Link was waving at me as I came through the doors and into the arms of my second home; a country I love, enjoy and feel so comfortable in. Ah, Bangkok! You either love it or hate it. I love it! Yes, it’s crazy, frenetic and muggy, but perhaps it’s the sensory overload that I find so appealing. Bangkok, you and I have the same personality, which is perhaps why I love you so! It was quite late by the time we arrived at Pong and Link’s house, which is in the south of Bangkok, but at the glass door was Nu Deang waving, the adorable not quite yet one year old baby I had met last year, who was now two and a half. Bright as a button, she was not going to miss out on the action. She knew I was coming and was waiting up. It was so lovely to see Pong and Nu Deang again, and I was greeted with big hugs from both of them. Nu Deang introduced me to her baby brother Sean and took me up to my room and told me that that is where I would be sleeping. A bit of chit chat all round and then we went to bed. At least tomorrow was Sunday and I would be able to spend some time with the family. To market, to market … on Sunday morning Link, Nu Deang and I went to the local market to buy some food. My love of markets, any market, is no secret. They are the pulse of a nation! They tell you so much about its people. And I just love that whole … when in Rome! This is the real Thailand. First up, some Thai coffee, complete with both evaporated and condensed milk! Oh yes, if you don’t like sugar … in Thailand you will have to build a very big bridge and get over it! I don’t have sugar in my coffee at home, but hey, I do in Thailand. We wandered around, had a look and bought some food. Link and Pong were so totally hospitable. I feel so honoured to have such special friends. Back at home we chatted and ate. In the afternoon Link’s parents and sister, Sung, came around. It was just really lovely to hang around and be ‘part of the family’. Nu Deang is a little doll, and her first language is actually English because that is what her parents speak to her in so that she can be bilingual. She is such a well-mannered and gorgeous little girl, and we really did have so much fun together. 15 minute haircut … love it! On the Monday I went out to the local shopping centre and had my hair cut. Link and Pong recommended where to go and off I went. My kind of place … fifteen minutes, a funky haircut and $6.50 (200 baht) later, I was out! Edward Scissorhands had weaved her magic! I am not one for pampering and three hour hair cuts. Cut my hair and let me get out! I also decided to have a massage. Massage places in Thailand are everywhere and the Thai use them regularly. Thailand is renowned for its massages, which cost from $5.00 upward an hour, depending on where you go. Oh, it was soooooo good. When I come to Thailand I pack in as many as I can. Pong helped me map out what I would do over the next couple of weeks. A few days on the island of Ko Samet, back for a night with Pong and Link, some time with her parents north of Kanchanaburi near the Myanmar border and then back to Bangkok for a few days shopping before flying back to Melbourne . Sorted! Link has an IT background like Alex, so I was technologically wired, so to speak. In my lifetime I have travelled so extensively alone but the boys made sure that I was contactable 24/7! So, on the Tuesday morning I set off nice and early with Link, and he dropped me off close to where he works in the centre, from which I caught the skytrain to the Ekamai bus station. By mid-morning I was on a bus to Ko Samet. Only 220 kilometres southeast of Bangkok, I chose this island because it was relatively close. To be honest I had never thought to do it before, as being so close to Bangkok, it has a bit of a reputation as not only being party-central but also totally overcrowded, especially on weekends. Not really my deal! With fairly low expectations, however, I thought I’d give it a go. After some five hours we were at Ban Phe pier from where the ferry ride was about 40 minutes across to Ko Samet. It was a lovely sunny day and the short ride across was relaxing. Once across, I made my way to the area where I had picked some potential places to stay. The island is only eightkilometres long and so the initial walk was quite short, possibly less than two kilometres. As I walked I noticed lots of muddy potholes and lots of water. It had obviously been raining quite heavily. This is not what I had expected, and I say this in a good way. Ko Samet seemed to be a pretty little island that had not been as damaged by tourism as I thought. Having said that, it is a national park and thankfully along with that has come some rules with not being allowed to build upwards. In this way the island has been saved from becoming the ugly monstrosity that places like Phuket have become! Sure, there were tourists, but it was also interspersed with locals, including fishermen. I could see where tourism had bobbed up its head, but I did not feel that it had taken over the island. Relief! And I must say, a pretty little island it is. After checking out a few places, I settled on Tubtim Resort. Sounds pretty flash, but it was really just a set of comfy bungalows perched up on a hill with the jungle behind and a gorgeous view of the beach in front. This is where I would spend the next five nights … well to sleep anyway. You know what I am like, always up and about and doing something. It did indeed rain quite a bit and although I did not get much sunbaking in (one two hour session with sunshine and another two hour session with clouds, but at least no rain), I did go on a couple of hikes and did a lot of walking. I met a lovely Dutch couple called Monique and Davey who were staying in the bungalow next to me, but as it was low season there were very few people actually around. I had read a bit on Ko Samet, and I was not sure what to expect. I just don’t do doof-doof music these days (oops, I just inferred that I once did! ), and Iwas hoping that my night times would be pleasant and relaxing. Fortunately, I was able to do this, but was told that in the high season this was most certainly not the case. Sure, there was music at night and some outdoor performances, like fire shows, but it was all rather low key. I found a few local restaurants where I indulged in one of my favourite Thai dishes, green curry, and the coconut shakes are always good! I found a great massage place, Aloha Samed Massage, run by lady-boy Aida, and boy did s/he give a good massage. Sunshine (well, a bit of it! ), good food and good massage … what more could one ask for? One day I decided to explore the island, heading south, and made my way right down to the southern tip. I must say the views of the sea beneath the jungle were exhilarating, and I weaved in and out of jungle and beach to maximise my views. Gorgeous white sand views everywhere. Thailand rarely disappoints! The many beaches and bays that I passed were spectacular such as Ao Vong Duan, Ao Wai and Ao Kiu Na Nok. The further south I walked, the more isolated it became, as the beaches are harder to get to. I finally made it to the tip, Ao Karang from which you could see the tiny island of Ko Chan. I sat down, breathed in the beauty and chilled … I was the only one there … just the way I like it! And so, my few days on Ko Samet came to an end. I would be catching the Sunday morning ferry at 8.00am, as I wanted to spend some time with Link and Pong before moving on once again. Of course the skies opened up and I had to trudge through the rain to get to the port, but hey, it’s all part of the fun! Before I knew it, I was back with my Thai family who surprised me with an early birthday cake (I would be leaving Thailand on my actual birthday). What a lovely surprise indeed! I was only there for a night, as the next day I was going out to visit Pong’s parents two hours north-west of Kanchanaburi, near the border of Myanmar. I would leave the next morning. The next adventure awaited me. Next:Hot springs, amazing homemade food and visiting the Myanmar border in and around Kanchanaburi province with Pong’s parents, Chai and Ta. Dedication:To my wonderful friends Pong and Link. Thank you for your hospitality and warmth. Thank you for making me feel like part of your family and for allowing me to ‘adopt’ Nu Deang and Sean as my niece and nephew. Thank you for caring and looking after me. You are very special to me and I have adopted all of you as MY Thai family! Kap Khun Ka. Miss Tim … only in Thailand!